This time, we get to know Ann Foster, host of Radio Book Club, which comes to the air every Wednesday at 7pm. As part of CFCR’s Spoken Word block of programming, Radio Book Club brings listeners an informative half-hour devoted to books and stories of all kinds, often with interesting interview guests in the mix. Originally called The Book Show, Ann has been doing her show at CFCR for nearly 10 years! While some of our Spoken Word programs feature a variety of hosts to spread out the workload, Ann has primarily produced her program all on her own. Ann has also been a reliable volunteer off the air, participating with our FM-Phasis fundraising drive and various other events. 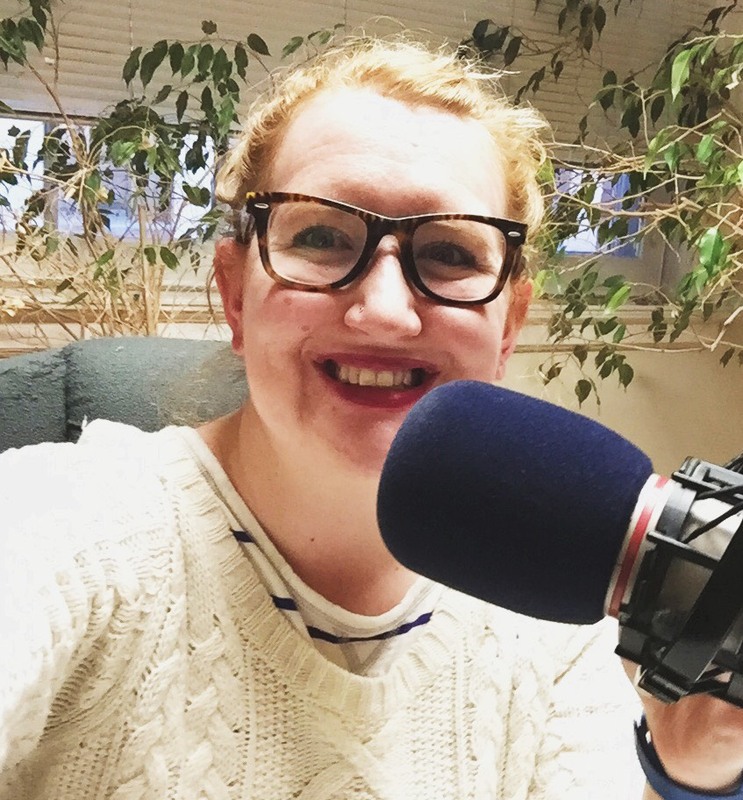 Ann has recently announced that she’ll be stepping down from her post on Radio Book Club in April, but we commend her for all her hard work as a CFCR programmer! I had done a show on the local community radio station in Halifax (shoutout to CKDU), where I come from, so when I moved to Saskatoon in 2007 one of the first things I did was look up the local community radio station to see if I could host a show here, too. The staff was very welcoming and, as there wasn't already a literary-themed show on air and there was a spot available, I was able to get on-air pretty quickly. CFCR is such a valuable resource to the community -- from providing local artists and authors and politicians and change-makers with a platform to share their passions and ideas, to sharing news and information from so many sectors of Saskatoon. I love that when you tune into CFCR you're guaranteed to get something thought-provoking, interesting, and utterly unlike anything you can find elsewhere. One of my most memorable interviews -- possibly the most memorable interview -- was a phoner I held with W.P. Kinsella in 2015. He was coming to Saskatoon for the Word on the Street Festival, and I emailed his publicist to see if he'd be interested in a chat. I prepared more for that interview than I had for any other, due to his stature among the literary community and his legendarily larger-than-life personality. Just reading through some of the amazing quotes he'd given in previous interviews made me both excited and terrified to speak with him. I had seen he was often asked the same questions by other inteviewers, so I worked to find new and different things to ask him. Of course, he was 80 years old when I spoke with him, and it became evident almost instantly that he was most comfortable sharing the same anecdotes and tirades he'd given in other interviews -- hence, why he seemingly was always asked the same things. It was an invigorating, challenging, and unforgettable interview and I'm so glad I had a chance to talk with him before he passed away just about a year later. I adore I Bet You Look Good on the Dance Floor, hosted by Matty D, which is the best and most eclectic show to listen to late at night. I met Matty when we were both working volunteer shifts during the funding drive a few years ago, and instantly bonded over our shared love of Doctor Who and Selena Gomez. I also really appreciate Civically Speaking, which airs the same time I'm pre-recording in the studio so I always get to hear a bit live -- very cool to have a show like that to learn about civic issues and hear from local politicians. Read lots, write lots, play board games, watch TV and movies, and generally hang out online. I've lately started publishing some pieces of TV criticism on Screenertv.com, which has influenced how I consume a lot of media lately -- always with an eye out for a good angle to write about, and furthering my appreciation of the work that goes into creating an ongoing TV series. I'm always partial to watching costume dramas or anything to do with time travel, which is an increasing amount of stuff these days. I'm always here for luxurious and random toppings, but green pepper is, to me, as crucial as crust, cheese, and sauce. Least favourite: I just am not a fan of that weird crumbly texture bacon gets when you put it on a pizza. I read constantly, and through hosting Radio Book Club I've been introduced to loads of fantastic local books. I've just finished reading a copy of Alice Kuipers' new YA (Young Adult) book, Me And Me, which is gorgeous and thought-provoking. I also adored Laughing All The Way To The Mosque by Zarqa Nawaz, who I was able to interview when she was in Saskatoon for the book launch: Zarqa is so hilarious and such a necessary voice. I also recently read Corvus by Harold Johnson for my book club, and it led to an absolutely fascinating discussion; it's a one of a kind take on environmental dystopia, and I love its conception of La Ronge as a major metropolis in the post-apocalyptic future. Jack Pine Press publishes amazing chapbooks, and I really adored their recent publication Pioneer 10, I Hear You by Donna Kane -- the poems, about the famous space probe, are heartbreaking and lovely, and the book itself is packaged in a Space Brand Emergency Blanket, and has a bookmark made from a strip of a cassette tape of David Bowie's Space Oddity.